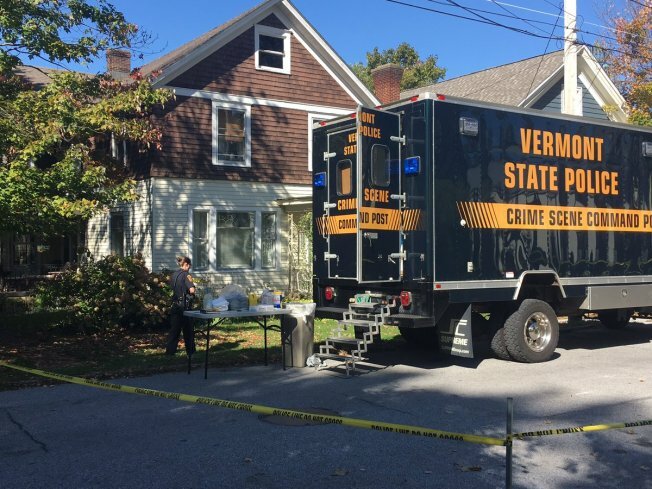 Investigators outside of a St. Albans, Vermont, apartment where a man and a woman were found dead from "obvious signs of violence and trauma." Police in St. Albans, Vermont released new information on two people found dead over the weekend in an apartment home on Lincoln Avenue. Police Chief Gary Taylor identified the people discovered late Sunday as 37-year-old Stephen Puro and a woman named 51-year-old Leaf Blouin. Investigators said Blouin was stabbed multiple times in the neck and torso. However, they said they do not know how Puro died, saying only that there was no trauma to his body. They also said it appears Puro died after Blouin. Police said they hope a toxicology report should shed light on Puro’s death, though noted that could take more than a month. Investigators said the upstairs apartment was locked from the inside, with no evidence of forced entry, and that the bodies might have been inside for several days before they were discovered. As NECN reported Monday, the man’s family called police after they had not heard from him for several days. St. Albans police said Stephen Puro had a lengthy criminal record, including charges of domestic violence and aggravated domestic assault, involving different victims.